Do you love dogs? Especially the west highland terrier? Who is Minnie The Westie? Minnie the dog is a Westie (west highland terrier) who has lots of adventures. These adventures are in two cartoon books that appeal to dog lovers of all ages. 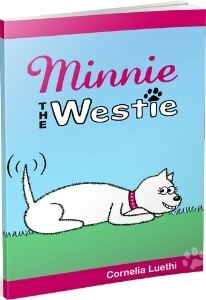 … This is Minnie The Westie’s first cartoon book. You’ll discover that Minnie is food-obsessed and sometimes just a little bit stubborn. But she can charm her way out of any mischief with her waggy tail and big, adoring eyes. There’s also a Kindle ebook version! Minnie The Westie: The Adventures Of A Cartoon West Highland Terrier Cartoon Dog is also available as a Kindle ebook from Amazon.com, Amazon.co.uk and Amazon.de. Just like the paperback book, the Kindle version contains 85 black-and-white Minnie The Westie cartoons. NEW! Minnie The Westie – Sailor Dog Vacation: The Adventures Of A West Highland Terrier Cartoon Dog At Sea! Minnie goes sailing in her second book of cartoon adventures. Minnie is an experienced sailor dog, so you’re in good paws. Join her as she sniffs out adventures on the beach, meets new friends… and snoozes in the sun (which is very impawtant on holiday). Like the first book, this contains 85 black-and-white Minnie The Westie cartoons that appeal to dog lovers of all ages. This book is available as a paperback. Thanks for visiting! 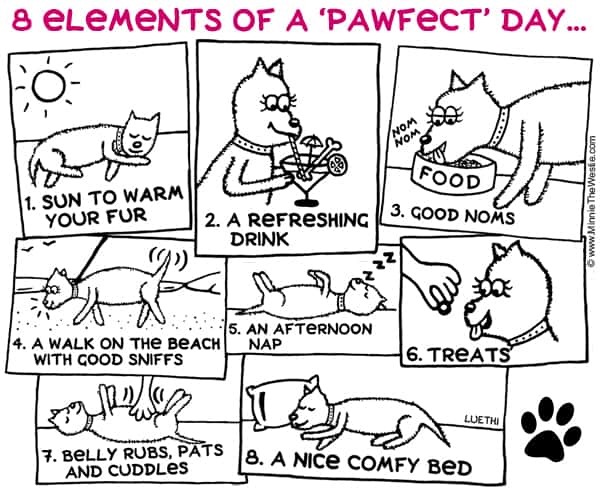 And make sure you check out my dog cartoons!